A very versatile bend compound that can do bend, a lathe, taper, shear, twist, etc. Demonstrated here. You can also find a lot of information in the si-community thread linked below. Make sure to look at Pedro's TD reel Nodal Setups and Utilities Reel 2015. Probably too many options for the common needs, but it is nice to have them there when more is requested. It can basically work as a bend, a lathe, taper, shear, twist, etc. Last edited by probiner on 18 Apr 2016, 18:19, edited 1 time in total. with various information that can come both in, and things made readily accessible coming out of the compound for more advanced use. I did just one little update (same file link), something I restrained myself of doing for the code version, but here it doesn't matter BBox options and ports. It either uses the set BBox + the ports or just the ports. This allows to have an animated set not messing with the BBox values. If someone is interested in a collaboration to a apply the python into some other application let me know as I'm just dealing with the vector transformation operation, not the SDK details, to build UI, associate animation curves and get and set data. BTW, can the optionally definable BBox be driven by an actual box in view geo (like other manipulators shown) ? Otherwise for the name perhaps pb_BBoxBendShearTwistTaperPlus ? Kidding aside, I do find it could use a more representative name which currently sounds like to just set a basic bend (which is anything but basic) even just appending "Advanced" or something would serve it justice I think. Thanks FXDude I did try to set a nice standard of Bend. Indeed I could put _Advanced on it, but I was modest, and probably not wise to do it now, since it's already out. 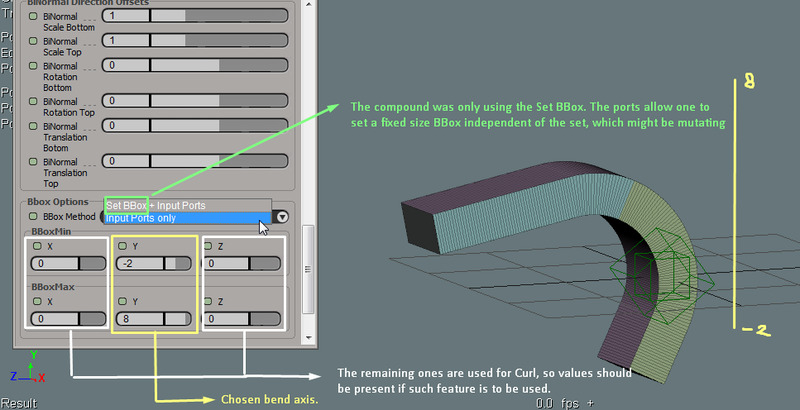 The "Advanced" is understood in the description of the tool. Mind you though that it circles around bending and while you can use the others on their own, they are just passengers for the ride. Maybe in a future I can build something that centralizes the BBox and just distributes it to any deformer that wants to use it. In this case that BBox parameter is the output "BottomTop Gradient"
I'm not sure I follow your question. You mean having nulls defining the BBox? Here's a gfycat showing two nulls driving BBox and how it also affects Curl. probiner wrote: Mind you though that it circles around bending and while you can use the others on their own, they are just passengers for the ride. I think I was thrown-off by the numeric bounding-box parameters in the property page, but yes null contollers defining the limits are awesome! One last thought if it would relatively easily be or remotely feasable, would be possible to 'grade' the effect using a profile curve to allow for gradual (vs. linear) falloffs along the affected areas? 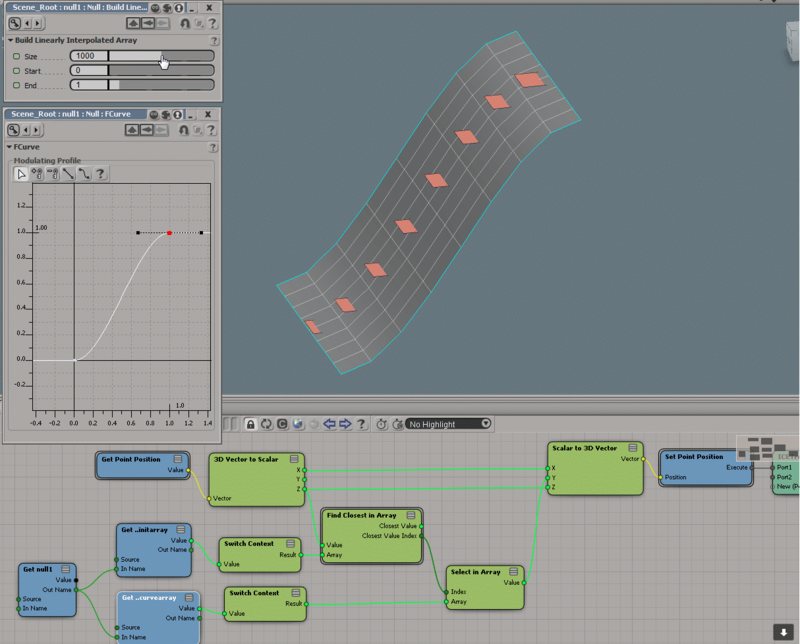 But that's overkill for this bend If there was a curve node with 4 2D inputs for p0,p1,p2,p3 I would implement it since as you animate those points you can define the bezier curve. I thought about doing it right in ICE like I did in code. But search algorithms are not great in ICE due to poor looping capabilities. Indeed the falloff parameter seems to quite effectively address any sharp bend start/end points. But I think I meant more "artistically" speaking, or to have the ability to more or less slowly or gradually go into the deform before the bending becomes (exponentially) more prominent, or to have very gradual 'ease-in' and 'ease-out' of the effect. probiner wrote: I thought about doing it right in ICE like I did in code. But search algorithms are not great in ICE due to poor looping capabilities. It reminded me of this (by Pooby) if it would potentially be implementable? In any event, even without any of that, I think the falloff parameter (or as shown in one of your shots, delving in the compound to set different profiles) would be more than sufficient for the large majority of cases. BTW, everything in that video is nothing short of awesome! You have great talent my friend! While you can have a curve that does the same you can't have a gradient doing the same as a curve, especially if you don't have handle controls per key or parameters like TCB. Anyways I do wish for a more "drawing" ability to control the falloff. 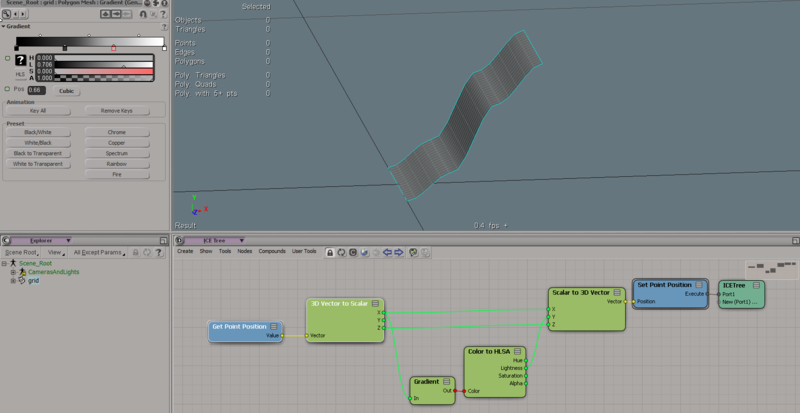 IF this was only a modeling tool I would have slapped the profile curve without a problem. Thanks for the discussion and sorry for the very late reply. Today was working a bit of code that touched thisa and thought it would be nice share. The search part can be avoided if you do a 3D surface and raycast on the Y axis. But it's not as clean as a self contained compound. 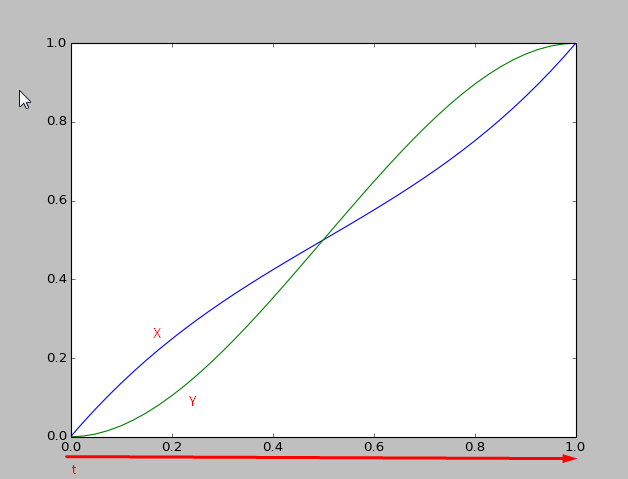 Hi sorry I missed your post, indeed pretty neat for arbitrary and animatable curve profiles, congratz!